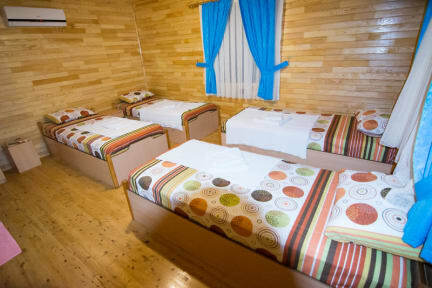 ''Olympos Orange'' with bungalows, dorm rooms,cabins, wooden houses; include breakfast and buffet dinner. %10 Discount for all Hostelworld.com guests on blue cruise,flame tours,Sunken City boat tour, Sea Kayaking. Where nature combines history with the great views of the Mediterranean cost which gives the name to the color 'Turqouse' in Turkey. 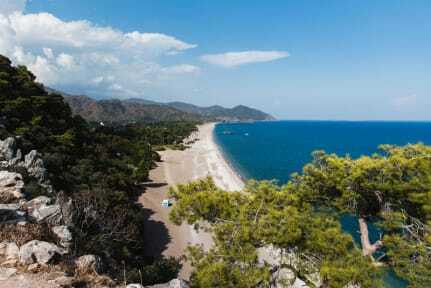 The valley Olympos oppening to the ancient city between the orange gardens and the mystichal athmosphere of mythology. Orange is open whole year around with all facilities. We have bungalows, shared rooms and wooden houses, restaurant, bar, dancing bar, spor and nature activities, tours and agency services, wireless internet connection, loundry, car park and more services. All this and more a hidden valley in the middle of nature,bursting with history, a place full of fun. We are 600m from the beach and there are platforms (resting areas) and hammocks in the garden for the visitors who wants to relax. We also have an Orange Dancing Bar, with a perfect sound and lighting system. It is open till early in the morning for the visitors who wants to enjoy the mystic atmosphere in Olympos.